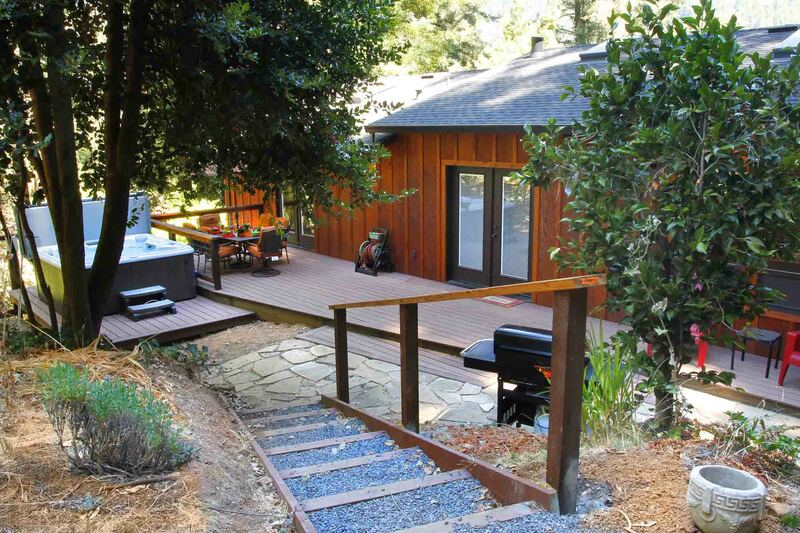 Peaceful, Remodeled Contemporary Home on a Half Acre of Redwoods, Fenced Yard, Hot Tub, Gas Fireplace. Very Close to Wine Tasting at Westside Road. 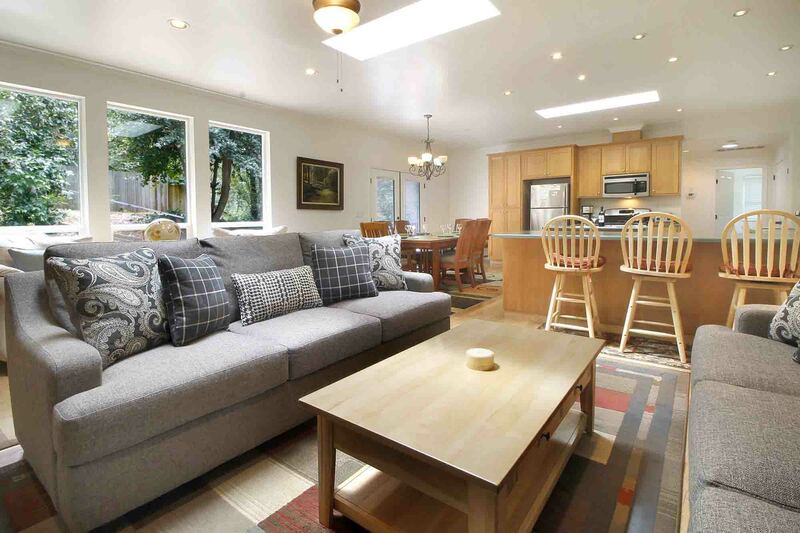 Short Drive to River Beaches, Market, Dining, Downtown Guerneville, Golf, Hiking, Coast. WIFI. Keyless Entry. Your Well-Behaved Dog is Welcome! This home has two levels, both accessible from separate parking areas. The upper level has a driveway with a carport, which opens to the main living space of the house, spacious living room, dining and kitchen open to each other. Off the kitchen end, there's a master bedroom with master bath and its own entry from the deck and yard. 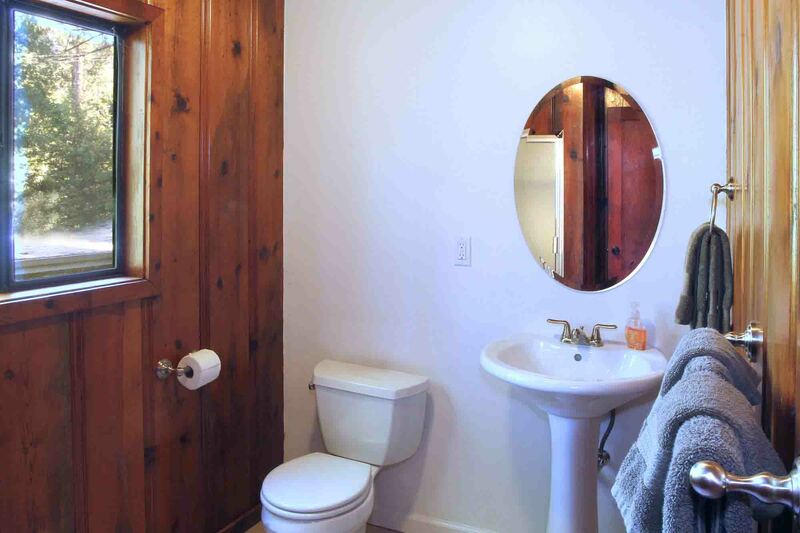 There's also a hall bath and another bedroom. 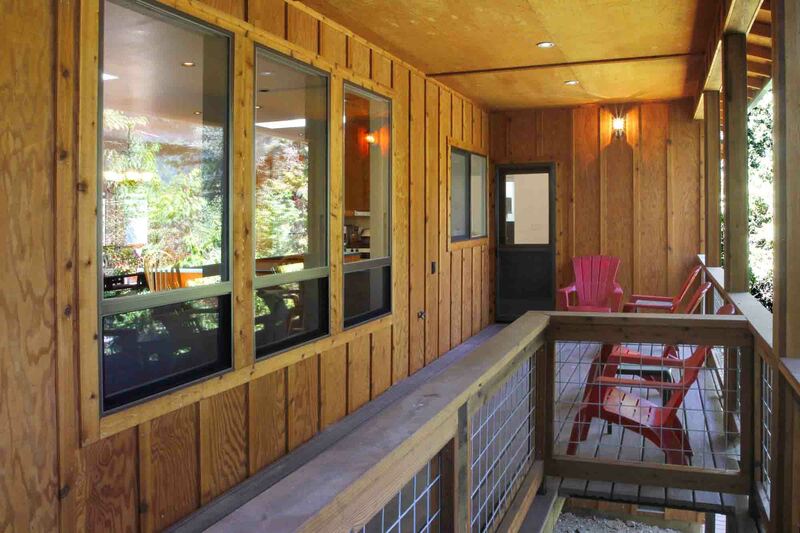 The dining area opens to decks with hot tub, outdoor dining and garden; all surrounded by secure 6' fencing. Stairs from one side of the house and a path winding through garden on the other lead to the lower unit (continuing on this path leads to the second parking area, a circular drive). The lower level holds a family room with games, a kitchenette, a bathroom and a third bedroom. The bedroom has its own entry that connects with the stairs leading up to the dining deck and kitchen. House is approximately 1800sf. Please note that there is no interior connection between the upper and lower levels. Ceiling Fans (living room, family room) No Air Conditioning. Great kitchen, it was completely stocked with all tools needed to chef up a feast. Had a nice secure yard for your furry family member to play. Very accommodating space. "Very nice house in a quiet and secluded are"
Very nice house in a quiet and secluded area. Extremely well furnished both inside and out. Lovely patio with chairs, tables, hot tub and hammock. Hard to find, so best to go in the daylight the first time. We unloaded in the upper driveway and then always parked in lower driveway and walked upstairs. The kitchen is very well stocked and the bedrooms and bathrooms upstairs were lovely. Our adult son stayed in the lower apartment and it was fine for him. The WiFi worked great, but cell service is limited. Very lovely house and we would highly recommend it. We loved our time in this immaculate, comfortable, well-prepped home. Fabulous base for a family wedding. Such a gorgeous, peaceful location and, oh, the drives to and from. Like a mini-Euro vacation! We'll be back! Highly recommended. Lots of space with a comfortable vibe. A little hard to find initially, but once we did it was beautiful! So quiet! "The house is beautiful! " The house is beautiful! The one issue is the parking, which is actually kind of scary and dangerous. Both the upper and lower spots require 4 wheel drive. The neighboring houses appear to have nicely graded driveways, but this one does not. Awesome place, highly recommend it! The house was lovely but relatively difficult to find. 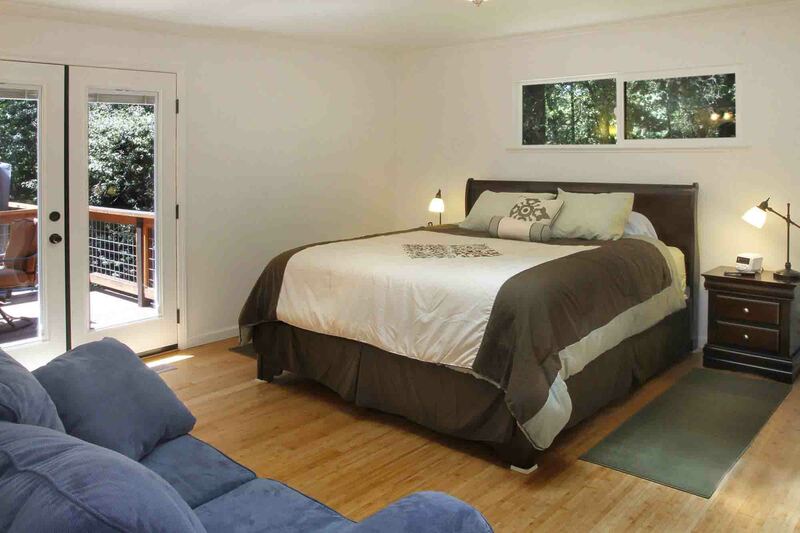 This home was beautifully decorated and loved the king beds in each of the two main bedrooms. Everything was just how it shows in the pictures and we were extremely pleased with our stay. After we unloaded our small SUV though we parked in the bottom driveway the rest of the trip. Getting in and out of the upper driveway is tricky. But mostly we couldn't even think of anything that could have been better. Super place! We may be back next year! "Nice chill place to stay"
Great setting and the operation is set up well. I was extremely impressed with River Getaways business practices and helpfulness to make my stay the most easeful and enjoyable as possible. Their customer support is off the charts. I will be recommending them to everyone I know. Much appreciation! We enjoyed New Year's holiday at Peace & Quiet and had a wonderful time. The home is furnished beautifully, the main house is open bringing all the wooded outdoors inside, has all the furnishings you need - well supplied in the kitchen and bedrooms. The downstairs unit worked well for a couple who was physically able to manipulate the walkways to and fro the main house. There were a few items that might need to be looked into for future tenants such as the directions to the house which led us to the lower unit rather than the main house and the main street did not have signage from Old River Road. The BBQ did not work but Russian River Getaways came out immediately on a holiday even to take care of it for us. Some of the pots and pans such as cookie sheets were not in good shape and need to be replaced. All in all these were minor and brief inconveniences which did not deter from our very good time at the home. 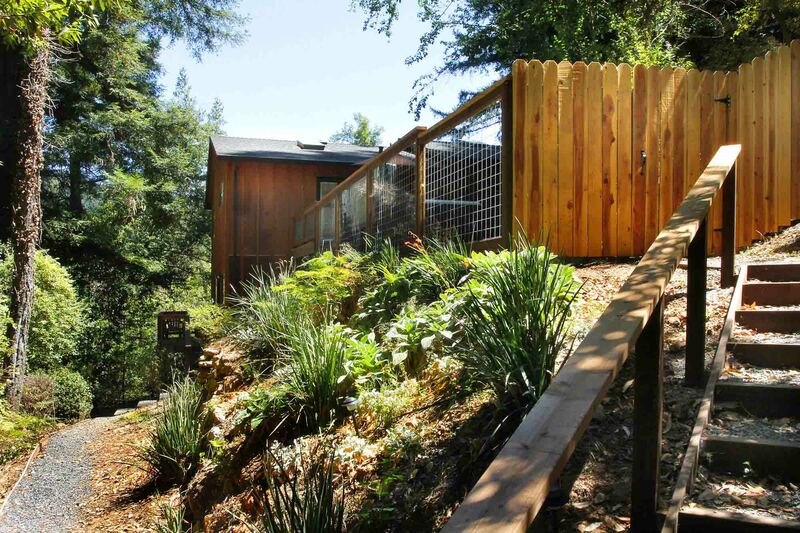 We will definitely return as both the house and Russian River Getaways were super! Whether mainly adults or families, all will enjoy this place. We had the best time staying at this location for our first sonoma trip. The binder the host left was incredibly helpful and we really appreciated the bottle of wine left out on our arrival. The cleaning staff come promptly at 11AM on check-out day so try to be out a little earlier than 11. Overall, we had a wonderful time - thank you! Awesome, clean, spacious home. Upper apartment is great and perfect for 2 couples. The 3rd bedroom, is in the lower apartment accessible from outside only. This is fine for another couple, but the amenities are not on par with the upper rooms, especially bathroom. Could be better for young adults in your party. Ideal location, especially if you are visiting Russian River wineries off of Westside or Eastside Road. "This is a lovely vacation home"
This is a lovely vacation home. It is situated among towering trees, but neighbors are very close. The kitchen is well stocked and the gas fireplace is so convenient. Didn't get a chance to use the hot tub or grill, but it was nice to have the option. The layout is very family friendly and we liked having the separation from the downstairs apartment to give our adult daughter and her guest more privacy. However, it is too separate to put children down there. "Great house and great location"
Great house and great location. A little difficult to find so if you can get therefore dark it will be helpful. Place is as represented online. Has everything you need and comms was excellent. I had a few questions over our stay and the response was always very quick. The insinkerator broke while we were there and they offered to send someone out to fix it. We were leaving the next day so didn't bother. Really cute place good for two couples or three. Especially with the separate downstairs bedroom and little living are. Would def consider booking again if looking in this area thanks so much. Great location, close to a lot of wineries. Nice, quiet home away from home! We loved staying here. 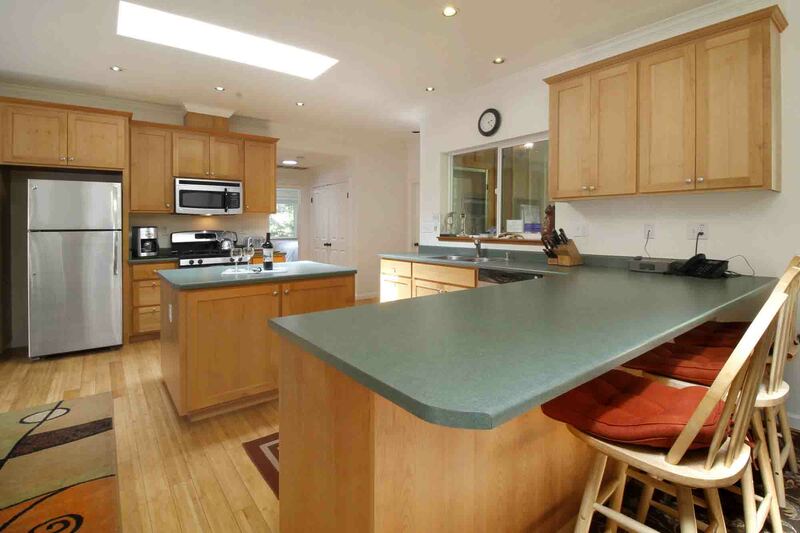 The location is great; central to everything you’d want to do in Sonoma County but also very secluded. I can’t recommend this place enough! "We had such a lovely stay! " We had such a lovely stay! It was the perfect place for a relaxing girls' weekend. Plenty of lounging space, the kitchen was great for cooking, and each bedroom had a fan (which was greatly appreciated during the heatwave). The house was spotless. We are already planning our return visit! Just an FYI bc it's not obvious from the pictures - the third bedroom is not in the part of the house with the other two bedrooms. It's downstairs and has its own entrance. We didn't mind this, but it was a little confusing finding it at night! 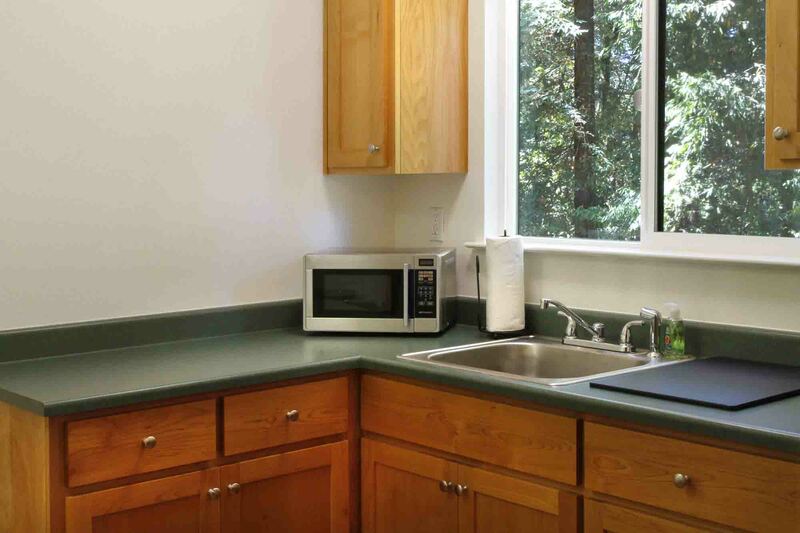 "New, very clean, well appointed"
Great location for Russian river wineries. Will definitely return. "Incredibly peaceful and beautiful surroundings"
Incredibly peaceful and beautiful surroundings. Awesome deck for relaxing and hot tubbing. Good proximity to some world class wineries. We stayed here for my partners birthday just to relax and enjoy the woods. We had an amazing time. We loved this place and will absolutely stay here again. The house was very clean and had great furniture. Also the kitchen had everything from pots, pans, bake ware, plenty of dishes, glasses, silverware and utensils. The hot tub was in good condition as was the grill. The beds were also very good. We felt comfortable and uncrowded with 5 adults. One TV was not working but everything else was. The roads are very narrow so walking and/or running needs to be planned. The hosts were very helpful when I called with questions. I would definitely recommend Peace and Quiet getaway. Very nice home tucked away but still near everything! Great Airbnb my boyfriend and I loved it! 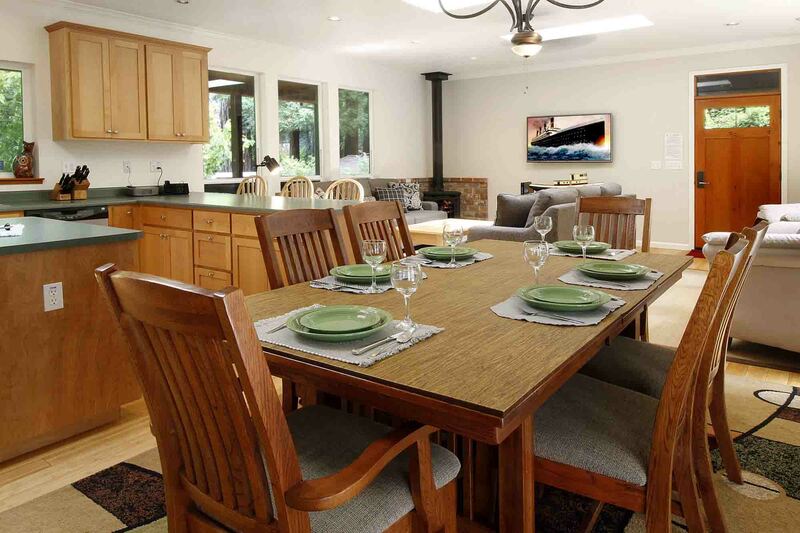 "A great place to stay in the Sonoma valley area"
A great place to stay in the Sonoma valley area! Very clean and quiet. Perfect for 3 couples. We had a great stay. The house was clean and well kept, the surroundings were peaceful, and the management company was very helpful and professional. We will use Russian Rivers Getaways again. Lovely wooded river retreat, for 3 couples in 30's!! Peace & quiet really says it all- really beautiful & spacious, we had an incredible time!! Walking distance to Mother's beach and very close to steelehead beach if the river is what you're after, so skip the parking and downtown hullabaloo, and enjoy the scenic setting and quiet (also decent little local market within 8 min walking distance as well! Super convenient). Fenced in yard was great for our well behaved family pet, and the kitchen was fully stocked with all the cooking gadgets you could need! No air conditioning- so prepare if you are visiting during hot weather (temps in the 90's during our stay- put the house at 79-85 degrees through our stay. Yikes!) Also, insect repellent is key if you plan to enjoy the outdoors after the sun goes down- the yard and deck areas are quite buggy (consider the wooded surrounding). All in all- lovely rental which we would definitely return to! Great house. Clean cheery everything we needed was there. Definitely recommend this house. Relaxing and lots of space. this is a great place if you want to get out in the country! "Great place we enjoyed it very much"
Great place we enjoyed it very much. Comfortable house and backyard. Jacuzzi was great since we went to do the Ironman Santa Rosa 70.3 so it came in handy for our pre race recovery. Very peaceful and quiet with great trees. House was stocked with everything we needed. Would love to come back. 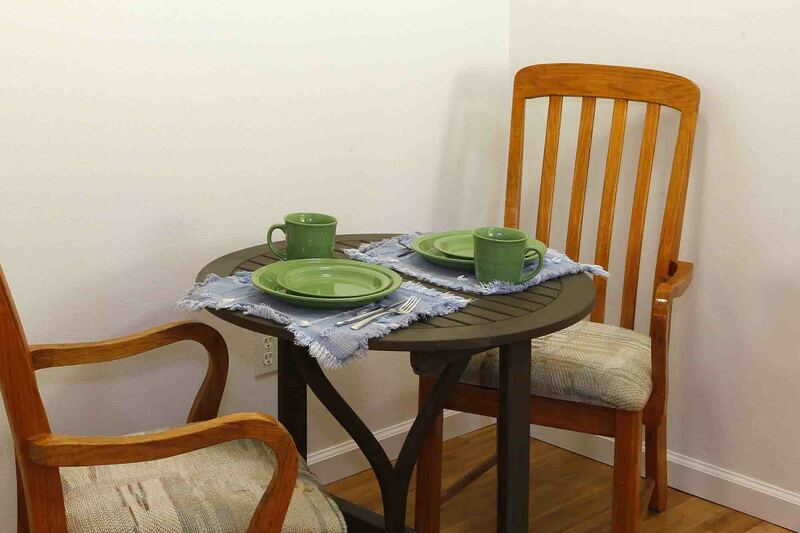 The house has all the things needed for a great stay, once you find the property. We used printed directions from the owners, which were not complete, had to ask a neighbor for help. The binder inside the house did have correct directions. The neighbors were a bit loud during the evening, but sleeping was not a problem. We would stay again now that we know how to get there. "We thoroughly enjoyed our stay"
We thoroughly enjoyed our stay. The house is clean, comfortable and pleasant. The kitchen was well-stocked and spacious. It was a wonderful base for exploring different nearby towns. LOVED this place! Everything was as described. Clean, modern and everything thought of as far as our needs. We enjoyed all the amenities and exploring the surrounding area. I cannot wait to come back again! Absolutely lovely place. We stayed here with my parents, baby and a couple dogs. Everyone had a fantastic time and we cooked some epic meals in the large kitchen. Loved the appletv tv too, great touch. We hope to go back soon! "We really enjoyed our stay at the River Getaway"
We really enjoyed our stay at the River Getaway! 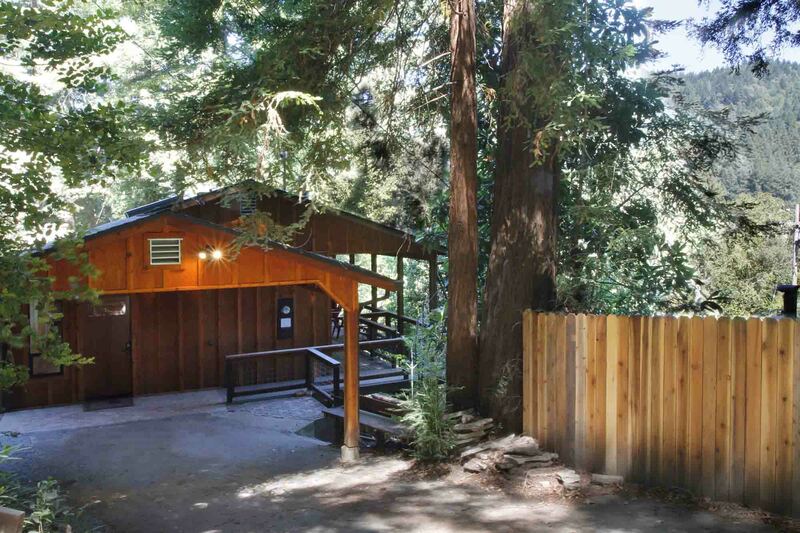 The house was surrounded by beautiful redwoods and lush greenery that made us feel like we were worlds away. The bedrooms were very spacious and the single unit downstairs was a great addition for our group. We were close to wineries in either direction and downtown Guerneville was a short drive away. We hope to return in the summer so we can enjoy the Russian River. The house was peaceful, spacious and well equip. We enjoyed gathering in the large kitchen / living room area. The host was very prompt and detailed with communication. Overall a great stay! Very nice to see a bottle of wine on the counter since we had been caught up in five hours of traffic from Los Gatos! We really enjoyed our stay. House is beautiful and in a perfect location. The house was just like the pictures, clean, bright &amp; comfortable. 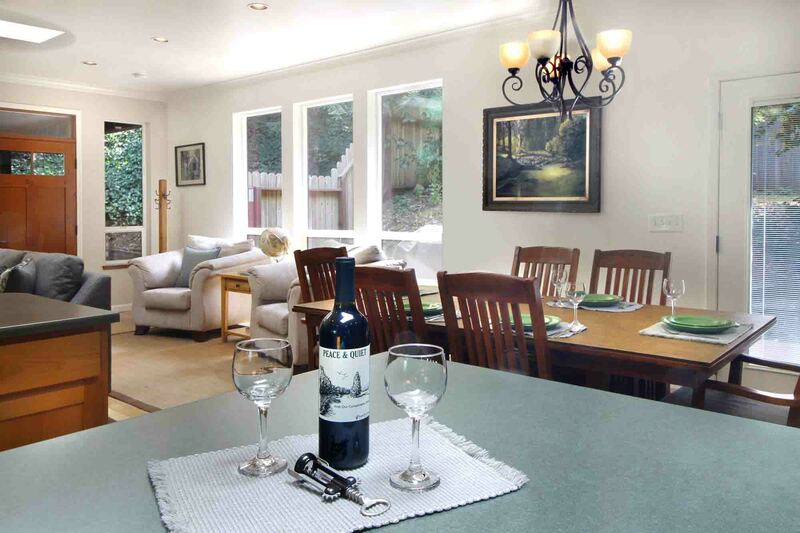 Close proximity to river &amp; wineries. One big flaw was the directions in getting to house. We were told NOT to follow GPS, rather follow the written directions emailed to us, which were not very clear or accurate. The directions that were in the info booklet in the house were in fact clear and correct, but that made no difference because we could not see them until in fact we got there! Otherwise all was a good experience. "Our group had a great experience at Peace & Quiet"
Our group had a great experience at Peace & Quiet. The house was perfect for our group of 3 couples. We enjoyed the deck (which has great privacy), hot tub and spacious kitchen. The location is beautiful and the house itself was clean and organized. 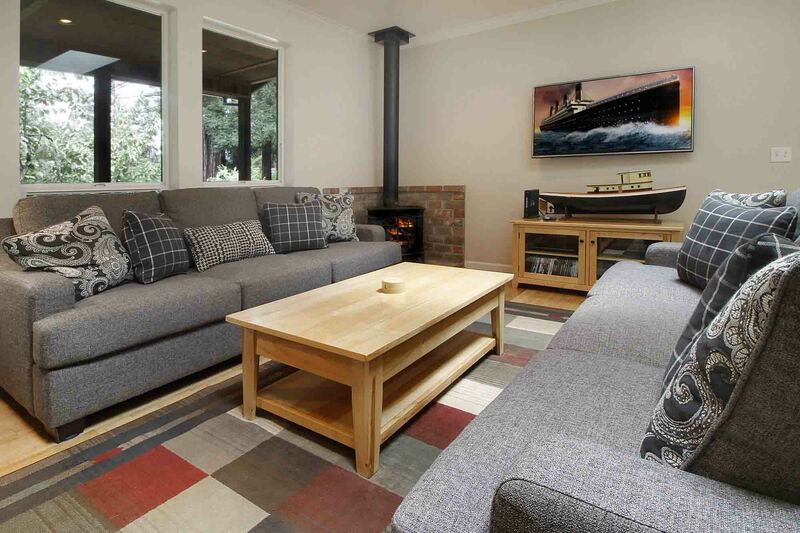 We would recommend this house to anyone and plan to stay again, if we get back to the area. We loved this property, it was large enough to accommodate our multigenerational family's visit. The parents stayed in the in-law downstairs and we stayed in the main house with the kids. This house has a multi level gated yard that kept the kids and dog safe. 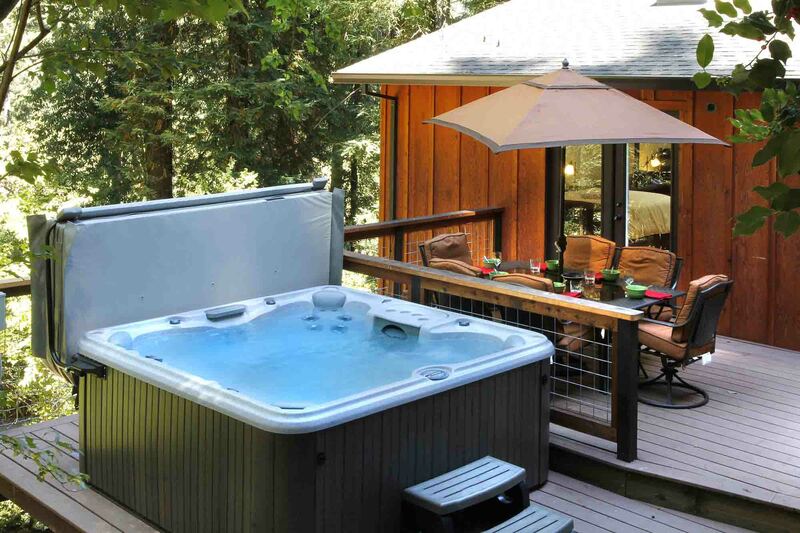 The hot tub & deck were perfect to enjoy and the furniture was comfortable and the house nicely decorated. The beds were very comfortable and the sheets were good quality. We really loved our end of summer get away in nature with all the creature comforts that make a mom stay sane with little kids. The house is very clean and well appointed. "Peace and Quiet was the perfect getaway"
Peace and Quiet was the perfect getaway. 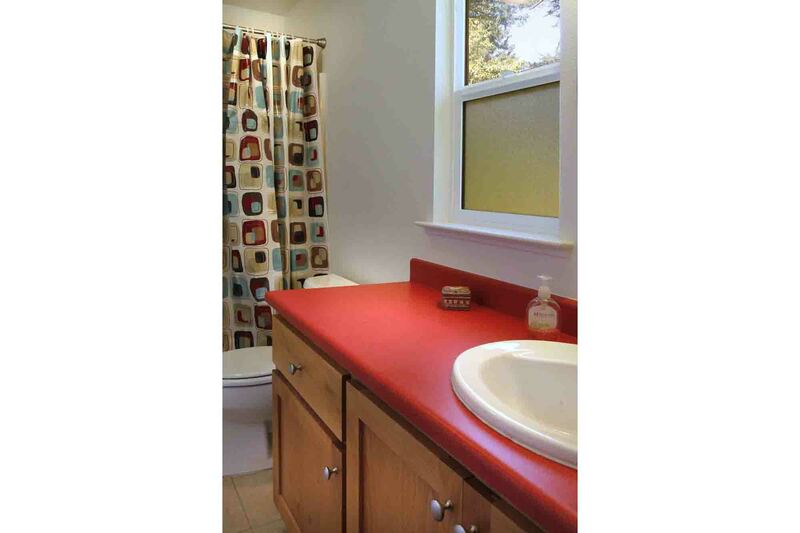 The home is beautiful and spacious with many amenities including a fully stocked kitchen, washer, and dryer. 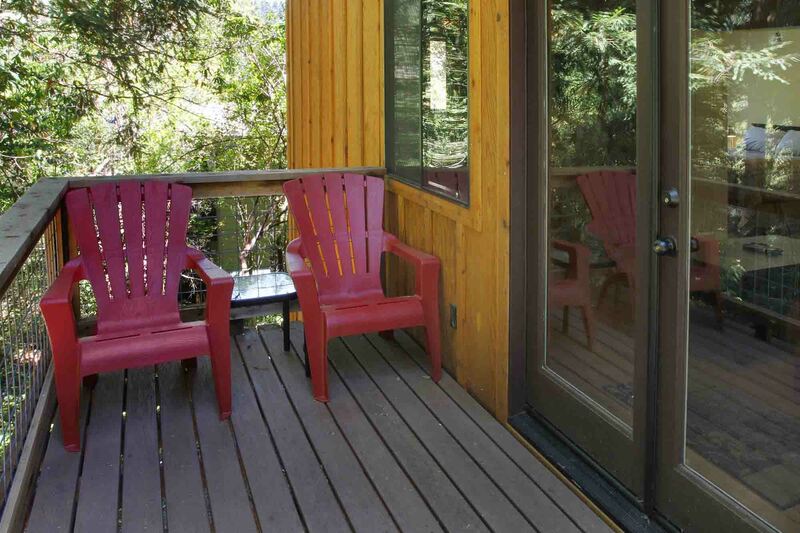 The separate unit is perfect for privacy for fellow guests (we were a party of five with 2 dogs). 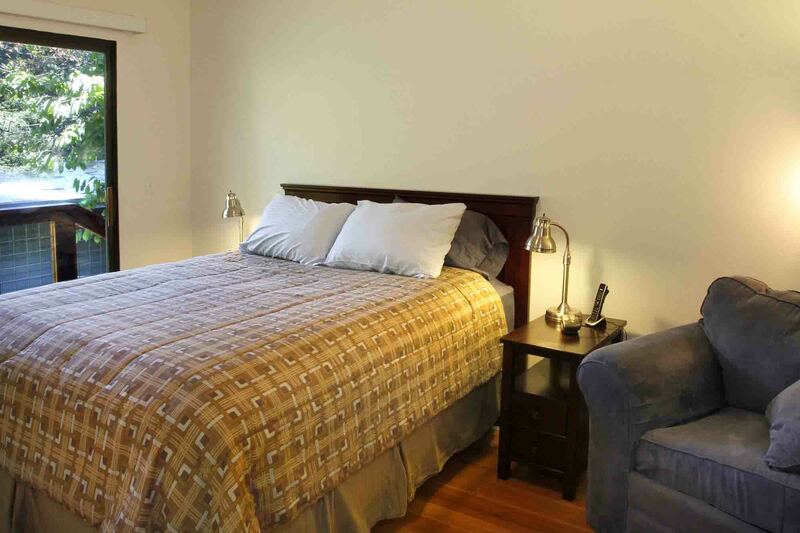 The home is located within walking distance of Mom's Beach and is just a short drive from other towns and attractions. There is a small store for basic neccesities just down the street. The neighborhood is tranquil with trees galore and quiet peaceful nights. We loved our stay and appreciated the dog friendly environment. There was even a tasty bottle of wine awaiting our arrival as an introduction to the wine country and an nice way to celebrate our first night in this stunning home. Thanks for making this a wonderful vacation - we hope to visit you again. Great stay! Nice place, instructions were very clear. Great access to kayaks and river. I would recommend to anyone looking for comfortability and convenience. "Very happy with Peace and Quiet"
Could not have been better. House was exactly as described -- plus immaculate and very well equipped. Absolutely wonderful experience staying there! "peace and quiet says it all"
we enjoyed our stay at peace and quiet, we all had the best sleep ever, I'm not sure if it was the wine, hot tub or mattress but the combo was great!! The kitchen was well equipped and we loved the hot tub. We recommend that you use the back driveway, its must easier to get in and out of, it was a bit challenging coming in late at night. Wonderful!! extremely clean rental. convenient to Napa, Sonoma and the coast. Would definitely stay there again. 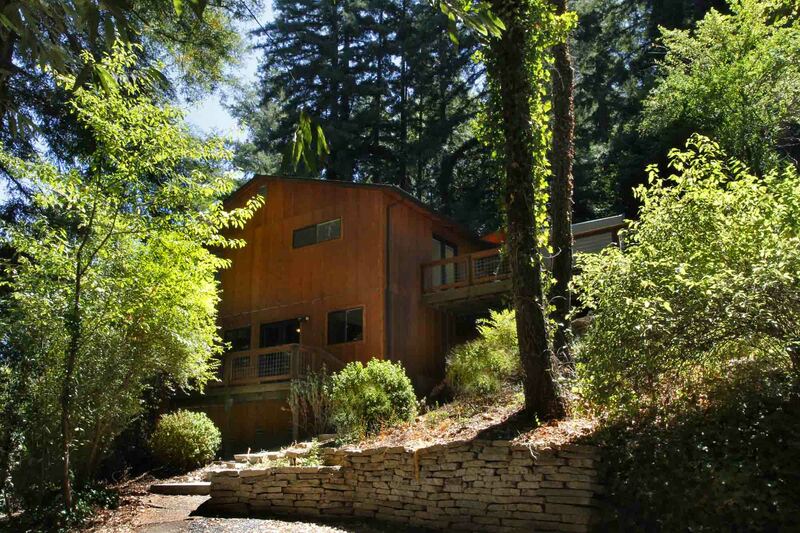 "Amazing house in inconvenient location"
The house and all amenities was absolutely perfect, however the location was too remote from key central Sonoma and Healdsburg vineyard locations. So remote in fact there was no cell service and we had to rely on the house phone. Backyard (with hot tub and grill) was amazing and mostly relaxing ... except for the neighbors dog constantly barking. "Lives up to it's name!" We had a wonderful time at Peace and Quiet. The upstairs of the house is nicely remodeled, the furnishing are very tasteful and it all feels relatively new. The upstairs is the best part. 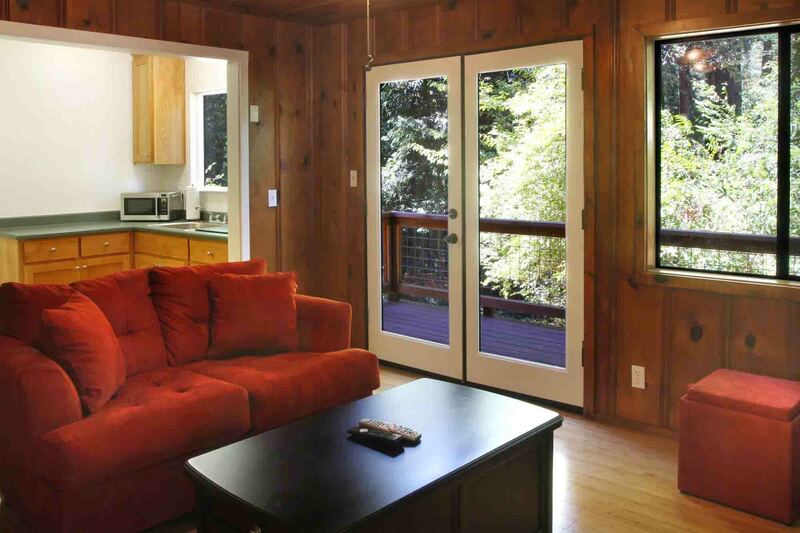 It is very spacious with lots of huge windows and light considering it is in the redwoods. The living/dining/kitchen area is one big open area with lots of room and a great place for everyone to hang out. There is a lot of access to the outside. The bedrooms were also light, airy and quite roomy. We have rented quite a few houses in this area and this one is my favorite so far!Even though the house is in a neighborhood with a rabbit warren of houses all up and down the hill, there is a real privacy due to the way the houses are laid out. The backyard area is great for a BBQ and the hot tub was great. Close to lots of great wineries and the river. There is a downstairs bedroom, with a living area, small kitchen and bathroom that we ended up not needing for two couples. It has been remodeled but has an older cabin feel to it compared to upstairs. Still very nice. It is like a separate unit as there is no internal connection and you must walk outside and down a hill to get to it. Not that that is necessarily a bad thing, if you have three couples it would provide more privacy if someone in the group wanted that. We were traveling a small child and it just didn't feel right to have the baby napping down there alone. There was plenty of room upstairs for that.The folks at the office where we booked our stay were really helpful and the place was in tip top shape. The place was super clean. There was even a bottle of wine waiting for us when we arrived. We were very happy with our stay here in the Russian River Valley. We took advantage of a winter special to spend a long weekend at this property and found it to be just about perfect for us. Tucked away in a cozy hillside neighborhood, this seems to be an established home which has been renovated with top-notch finishes. The property consists of two units, one on each floor. The upper floor has two bedrooms, a spacious kitchen and dining area, and an open living room, sized nicely for a small family. We were so happy upstairs that we didn't even bother to check out the lower floor. 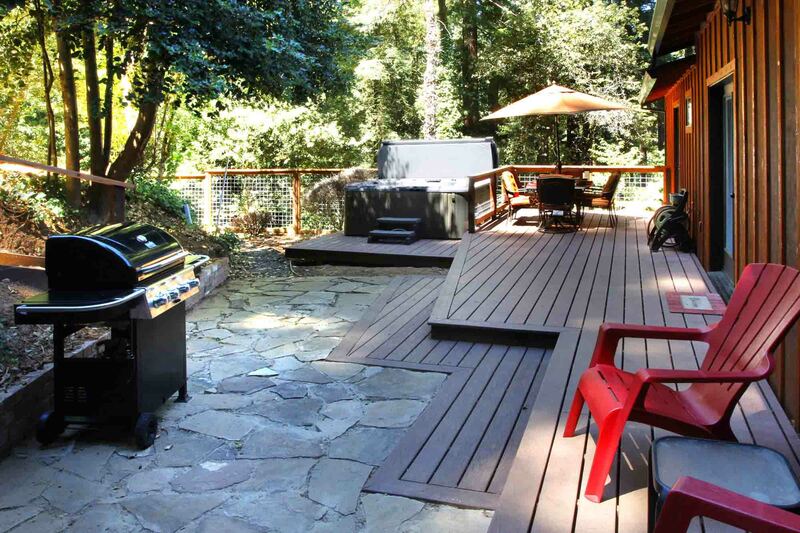 The property is pet friendly, so you can bring your dog along and hang out on the back deck with Fido running around off-leash since the small yard is fenced in.Located about 15 miles west of Santa Rosa, it works very well as a base for exploring the area. You can take a hike in a redwood forest in the morning, visit the Pacific Ocean for a picnic lunch, and be back to wine country in time to sample some lovely Zinfandel, Cabernet, and Chardonnay at some of the best wineries in California.After a full day of fun in the California sun, you can relax in the hot tub or enjoy a movie on the entertainment center. You'll also sleep like a baby on the comfortable king bed. There's very little we would change about this place. Sure, the kitchen could probably use another medium saucepan and the shower in the master bedroom takes a while to heat up, but nothing that would keep us away. I'm already looking forward to our next chance to stay here. This house is located in a wooded, beautiful, peaceful area. It is very clean. The pictures probably don't do it justice. This house is well stocked with everything that you will need. The little "apartment like" area in the lower part of the house was very nice. The backyard is very spacious and with a very nice hot tub. Excellent place to relax and enjoy the peace and quiet. We really appreciated the dog friendliness of this home, and so did our dog. The keyless access was very convenient. We really appreciated all the labeling of the lights, and the great explanations in the binder of how everything worked. Very organized. Great location, and very close to many things. We would not hesitate to stay here again. Just what our family needed!! "Awesome house for the six of us: quiet, beautiful, and clean." The communication with RRG was very comprehensive. 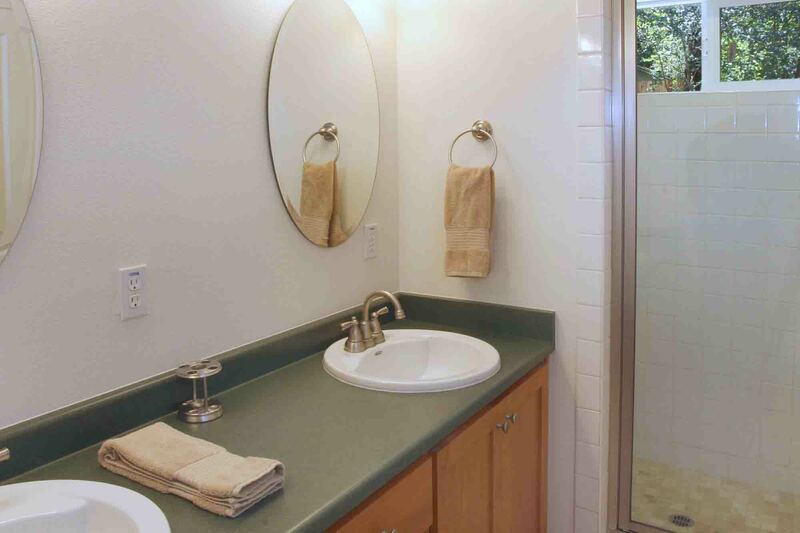 No problems with key; the house had all of the amenities shown, was very clean, and was very spacious. Temperature was colder on lower level than on upper, but still comfortable. The location was great for winery tours, and a grocery store within a five minute drive. Will go back to this house again if we plan to be in the area. The area is older, and some houses are less well-kept but some like this one were updated. We felt very safe and enjoyed walking around the loop to top of hill and back down Scenic Rd. to Old River Road. A real hamstring/calf work-out! "Great rental but left hungry"
The house is great - clean, new, stocked with all the necessary conveniences, including a hot tub. The floor plan is open and spacious. However, since there are no extra matresses or pull-out beds, 3 couples really is the max. The only bummer (and it was a big one) was the lack of propane for the BBQ grill. We ran out on the 2nd night of our 2 night stay and, despite what the house instructions said, there were no extra cannisters available. It was too late too make alternative dinner plans and we were pretty frustrated. Loved the home!!! Everything you could possibly need, except an aC. Just our luck we choose the week of an abnormal heat wave. The home does not have aC and it was really hot in the middle of the day. But we were so close to the river and the ocean we had to get to the water to cool down. It was a great vacation!! The home is lovely, well appointed, comfortable. Situated about 1 mile from Korbel Vineyards, it's close to Russian River wineries. We visited for Passport to Pinot, Russian River Valley. We enjoyed our stay.I gave it only 4 starts because it's not easy to get to. Single lane trails, uphill. Be careful backing into the upper driveway (carport). After having one drive wheel off terra firma when arriving for the first time, we parked in the lower driveway for the rest of our stay.The lower floor is its own apartment, with its own keyed entrance. There is no access to it from the upper floor. Not as problem for us since we weren't using it.Overall, a nice place in a convenient location. Most of our roads here in the Russian River area are small one lane roads and that's part of the charm of staying here. The upper driveway is tricky to maneuver but there is the bottom parking area, which is so much easier to use. This was my first time to wine country, the location was great !The house was perfect for us, everything was clean and very up to date . Having a code to get in to the house was great. It truly deserves the name Peace and Quiet! The only regret is we couldn't stay longer!Thank you! Peace and Quiet is centrally located to not only the wineries but to the river beaches and the little town of Forestville. Next time just plan on staying a few more days with us at this sweet home! "Pristine Home - Newly Remodeled - Great Layout"
This home is perfect for hanging out - great open floor plan and a wonderful deck and hot tub. Everything is new and well-appointed. 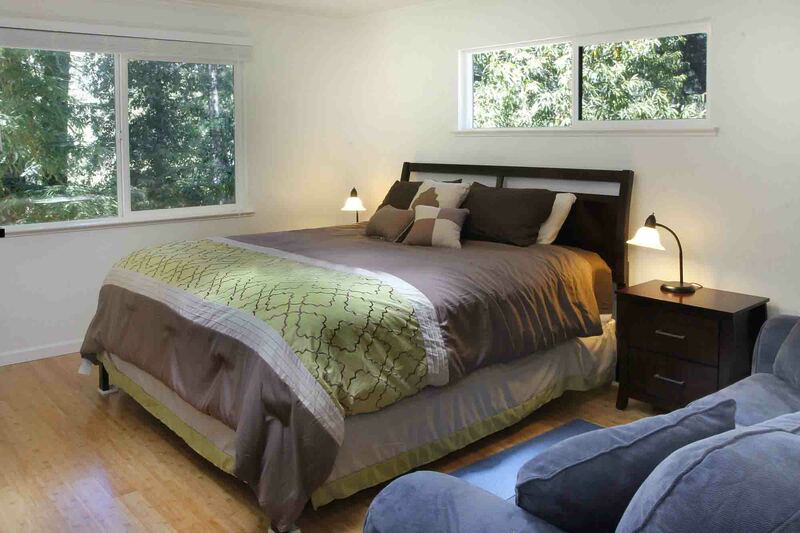 The 3rd bedroom (separate downstairs unit) is a plus or minus, depending on your situation. There is no lawn or flat open space as the home is on a hillside. We were all adults, so perfect for us. The downstairs unit has a mini-kitchen, but no refrigerator (would be nice to put a min-fridge in there). Location was great for what we wanted - but you must drive everywhere and the upper driveway is a bit tough to get out of - we were fine but it is not for nervous drivers!. There is spotty cell service in the area - no cell service in the house. But there is wifi that was excellent. Overall perfect for what we needed - not high-end but super clean, updated, and comfortable. I would definitely stay here again. Peace and Quiet is truly that! The upper driveway is a bit tricky but with plenty of parking down below it can be manageable. As far as cell service goes, the only provider that works almost everywhere out here on the Russian River is Verizon. Sometimes it's nice to not be available and being able to blame the cell service! We're glad you enjoyed your stay with us and hope to see you again soon. This house is perfect for a pet owner. Cool amenities, beautiful home, great location. The cabin was very nice and worked well for our family. There is a sperate living quarters downstairs and that worked for the couple we invited. House is well furnished and stocked, hot tub is great. You can tell that this place was recently renovated and almost everything in the place is new.Location is great, about 2 miles to the county river access and maybe 3 miles to Korbel. also near by are a few wineries.Only mild complaint I have is that the backyard area is not yet finished as far as landscaping goes but I can tell the infrastructure is there to finish it.the house itself was exceptionally clean when we got there but the backayrd/dirt area up top was pretty messy from the prior guests. that is why I gave it 4 out of 5 stars on cleanliness.Overall I give it a 4 out of 5 stars because there are more luxurious places that cost more on this site, but I would not hesitate to return.